Who doesn’t love a good makeover? 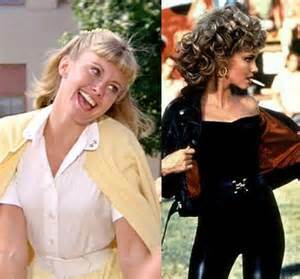 These are some of the best makeovers in film history as far as I’m concerned. 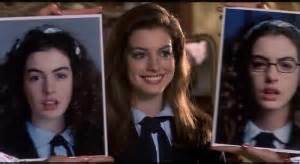 I remember as a kid, I genuinely thought that Mia (played by the stunning Anne Hathway) looked like that with her big curly hair. But then she got a makeover and then had the straight hair. That was pretty crazy of me to think but this was an incredible makeover. Her transformation had everything: it was dramatic, fun, and stunning. 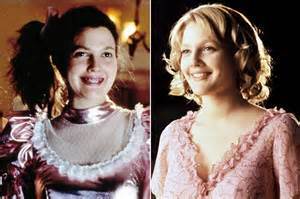 The best part of it all was Gracie still having the same personality despite her physical transformation. Vivian Ward went from being your average prostitute to a classy well dressed woman. This is a memorable and awesome transformation. Leading lady Cher did her best work on Tai, the new girl who was a tomboy that wore lots of plaid to a classy and stylish girl. Laney went from geek to chic in this teen chick flick. For most of the movie, Sandy is a modest good girl. 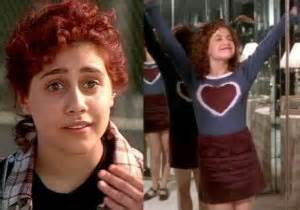 At the end of the movie, she realizes that the only way she can keep Danny is if she changes her appearance. Regardless of her reasons to do it, the end results of the makeover are incredibly badass and rad. Like Sandy, Cady is the new girl in town. Cady becomes influenced by the mean girls at her school and slowly transforms into one herself. Hey, at least the Plastics have awesome taste in fashion, lots of pink which I love. 25-year-old Josie is forced to relive the horrors of her high school years when she goes back to write a story about high school. She was really geeky back in the day but she’s not the same woman she was then. Josie is now chic and has A LOT better taste in clothes, enough to get her first kiss on a baseball field anyway. Do I Have The Power to Change The World? From an early age, many of us are told from an early age that we have the power to change the world. The encouragement and support is nice to hear that someone believes in us. But it’s also a lot of pressure. I mean, what does it even mean to change the world? What does it involve? Is there a limit to age or anything else? Every person defines what it means to change the world differently than the next person. I think it’s pretty clear that there’s no limit to how old or young you are, you can change the world. You have the power to change the world, that’s obvious to say the least. It’s always inspiring to me whenever people who are very young, even younger than me do something incredible. Girls like Malala Yousafzai, a Pakistani girl who was shot in the head when she was just 15 years old. Yousafzai’s father runs the school for girls and supports his daughters passion. Even after her assassination attempt, she hasn’t stopped fighting for girls. She even became the youngest Nobel Peace Prize winner which is pretty impressive. This story of one teenage girl fighting for what she believes in makes me further believe that all things are possible. Anybody can make an impact however they chose if they care about something enough. Our passions are enough to change the current state of the world. How many times have you been told that if you don’t like something, change it? That is absolutely true and it’s important to do. Malala is just one of many smart and inspiring teens who have a dream and go after it. They don’t let anything stop them and that’s what helps them change the world. It can be a lot of pressure to put on yourself in terms of making the world a better place. You can get caught up in being so set on making a difference. On not just standing by and actually getting involved and doing something. It can be easy to get into the habit of feeling stuck, like you can’t make a difference. The point is, don’t put pressure on yourself. Use your influence and you’re voice in order to do what you’re passionate about. Graduating from high school is one of the first of many big changes in any teenagers life. These songs capture the classic, cheesy, and pure sentiment of a high school graduation. This is more or less a list since no explanation is really needed for each of these. No one has it easy in life. Even these extremely successful people faced their fair share of setbacks. Being rejected and having negative things happen to them is partly what allowed them to succeed. Rowling faced hardship after hardship in her life. She was a single mother living in London, just scraping by to make ends meet to provide for herself and her daughter. Rowling ended up writing the first Harry Potter novel in Starbucks. After being rejected by publisher after publisher, a small London publishing company finally accepted it after his young daughter begged him to. It’s a good thing that he did considering the tremendous success Harry Potter has over the years. The co-founder of Apple was fired from the company he helped create. Besides that, he was also a college dropout. The cool that happened after he dropped out was that he started taking calligraphy classes he wouldn’t have otherwise taken. What he learned from those classes came to play when he designed the calligraphy on the Macintosh computers. During him time off from Apple, he founded next which made Toy Story and later became Pixar. He then got his job back at Apple and became CEO until his death. This female comedian was constantly questioned due to the fact she was a woman. She also faced serious loss after her husband committed suicide unexpectedly. Rivers was then left a single mom forced to provide for herself and her daughter. She then became one of the most innovative comedians who paved the way for other women in the comedy word. The famous horror writer was working as a high school janitor when he was inspired to write Carrie. He then faced repeated rejection and threw the manuscript away. His wife fished it out of the trash and encouraged him not to quit. The books, movies, music, TV, and sports that I like has changed tremendously over the years. I like to think that my personal tastes regarding pop culture has gotten a lot better, but I’m sure I’ll be saying the same exact thing when I look back in five years on the things I like now. While what I taste has changed, the fact that I love these things is the one constant. My love for pop culture and sports will never change. The same could be said for many others as well. As some people get older, they find that they may not listen to music as much as they once did. Pop culture becomes less of a crutch for some people. I can’t predict the future, but I highly doubt that my love for pop culture will ever go away. It’s been something that I’ve been able to turn to when I didn’t really have anything or anyone else. People have let me down in the past and pop culture hasn’t. It might sound sad that I’ve found such happiness from pop culture since it’s not a tangible thing or a physical live friend, but it’s still a comfort for me. Maybe I won’t depend on it as much as I did during high school. I’ve already been busier than I was back then. However, I can’t see that I’ll ever fully let go of that part of my life considering what a major role it’s played for me. In short, a lot of things change in life. Friends change, people change, what we love changes, and who we are as a person changes on a daily basis. But my love for pop culture and the happiness that it’s provided for me is one thing I know won’t go away. It’s a faithful friend that I love learning more and more about.